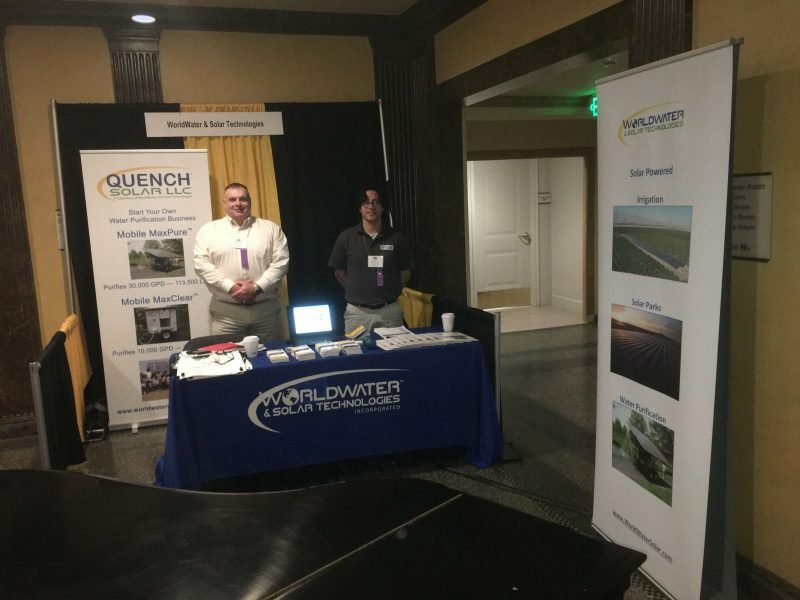 SYRACUSE, NEW YORK – On December 4th and 5th, representatives from WorldWater & Solar Technologies attended the 62nd annual agricultural event in Syracuse New York. Delegates from 52 county Farm Bureaus gathered to consider new policy recommendations, hear about crop concerns and changing demands relating to crop production. One area of patented technology WorldWater specializes in is their VariMax technology. That variable frequency drive can pump water out of the ground using 600 hp pumps, moving water over a 1,000 gallons per minute from wells over 1,000 feet deep. The technology is self-aware, automatically turning on and off depending on the location of the sun. The Farming industry would benefit using this technology because of all the cost savings it would permit. Operating, fuel, logistical, labor costs would decrease along with their electricity bill. The amount of power used would be reduced as well as maintenance costs. Unlike diesel generators, there are no moving parts with these solar irrigation projects, maintenance upkeep and costs are greatly reduced. Agribusiness has a relatively new, major player involved in their economy and solar energy is clean and only becoming cheaper and more efficient as each day passes. Solar energy is becoming more affordable to the general public but now farmers are starting realize the monetary benefits of using this renewable energy and WorldWater & Solar Technologies has the experience and capabilities of using solar energy in the farming industry to maximize farmers produce and profits. It was amazing how much cleaner this water was after it ran through the machine. Clean water is a necessity for good health (as) bad water can be a leading cause of many health problems. WorldWater & Solar Technologies, Inc. Copyright © WorldWater & Solar Technologies All Rights Reserved. Creative: Contact Designers.